I was reminded of this photo while thinking ahead to this weekend. A few years ago, I found these pheasant tracks after spending a morning in one of our crane viewing blind along the bank of the Platte River. This weekend, I get to spend three evenings in that same blind – sharing a world-class birding experience with members of The Nature Conservancy. Not a bad weekend, really. Pheasant tracks through alkaline-crusted sandy soil in a restored wetland along the Platte River, Nebraska. 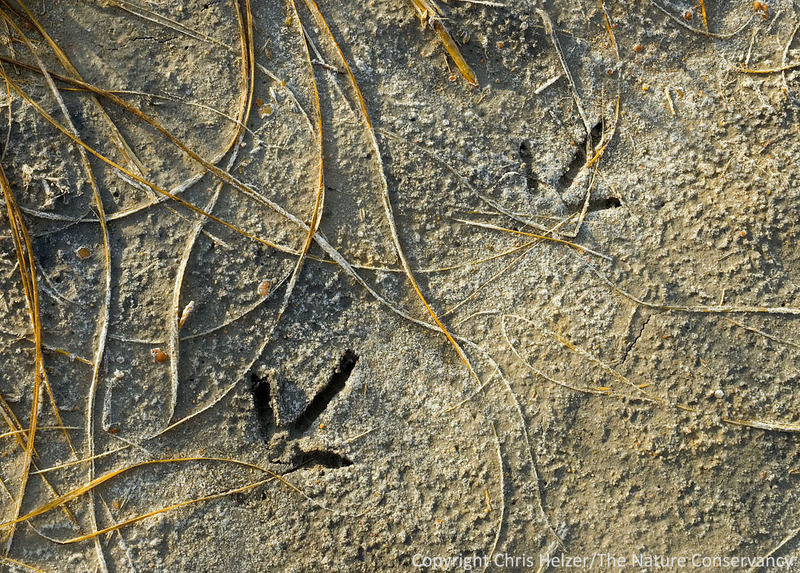 This entry was posted in Prairie Animals, Prairie Natural History, Prairie Photography and tagged alkaline soil, pheasant tracks, platte river, platte river prairies, wetland, woil by Chris Helzer. Bookmark the permalink. And they are ROOSTER tracks. Just be glad you were not walking through tall grass, and sneaked up on a pheasant there. I did that, and the pheasant flew out right in front of me. It was startling to see and hear that bird flush out right in front of me. Lucky for the pheasant, I did not have a rifle. But pheasants can be an element of surprise. Very nice photo, Chris. Having a pheasant burst out under a horse one is riding in tall grass is quite exciting too! Lucky for me, I somehow stayed on.